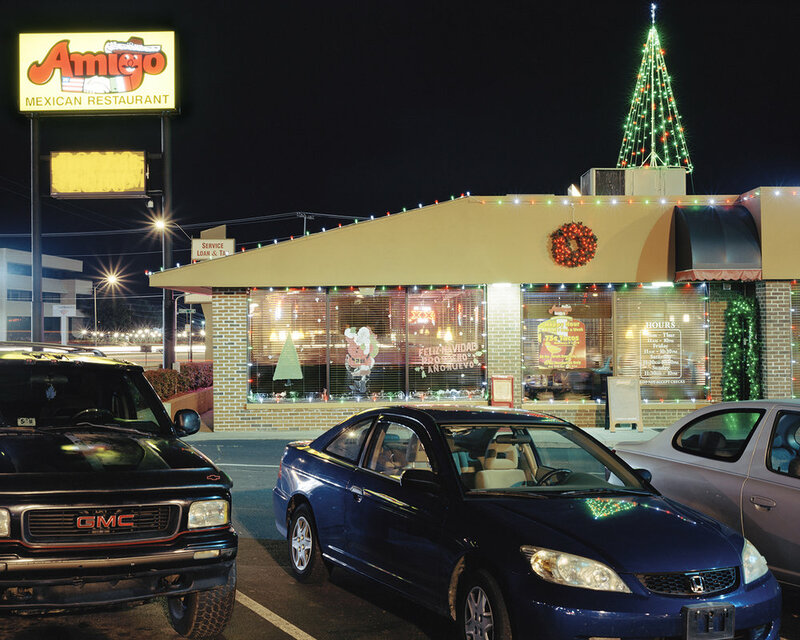 Hispanic Appalachia is a modest collection of twenty-five photographs by Megan G. King that explores the growing presence of Mexican and other Latinos in southeast Tennessee. King, a native of the region, began her documentation of the demographic and cultural shifts she witnessed “to show the importance of emerging diversity in this historically conservative region of the United States.” The vibrant photos in the collection veer our eyes to cultural artifacts, places, and people that King believes are integral to “the changing social landscape in Southern Appalachia.” The photographs in Hispanic Appalachia live online, and fragments of the collection have been featured by several online publications as part of a larger conversation on the sometimes-contentious topic of documented and undocumented Latino immigrants in American social life. My review of Hispanic Appalachia draws the reader’s attention to (1) King’s sophisticated selection of cultural artifacts to represent this budding community, and (2) the transferability of the cultural information and possible loss of some specific cultural meanings as the photos are used to frame more general narratives in various online spaces. King's photos are bursting with symbols quite specific to Mexican culture and identity. The cultural signs and symbols that are now commonplace to King are used to engage others in a more general conversation on immigration and cultural change. For King, and other longtime residents in Tennessee, Latino visual and food cultures are fundamentally changing the way Appalachia looks. For instance, the photograph “Aprons Hanging in a Home in Johnson City, Tennessee,” which recalls Depression Era documentary photography of everyday objects in all their pregnant ordinariness, is punctuated by the iconic Mexican eagle devouring the serpent perched on a cactus. King’s attention to cultural specificity is also present in her photograph of three small colorful ceramic skulls next to a family snapshot atop a dresser and, again, the photo of Anai Saucedo getting her face painted for a Dia de los Muertos celebration speaks to the Mexican-ness of this community. King appears to recognize the cultural currency of the symbols she’s highlighting and their presence in the American cultural lexicon. 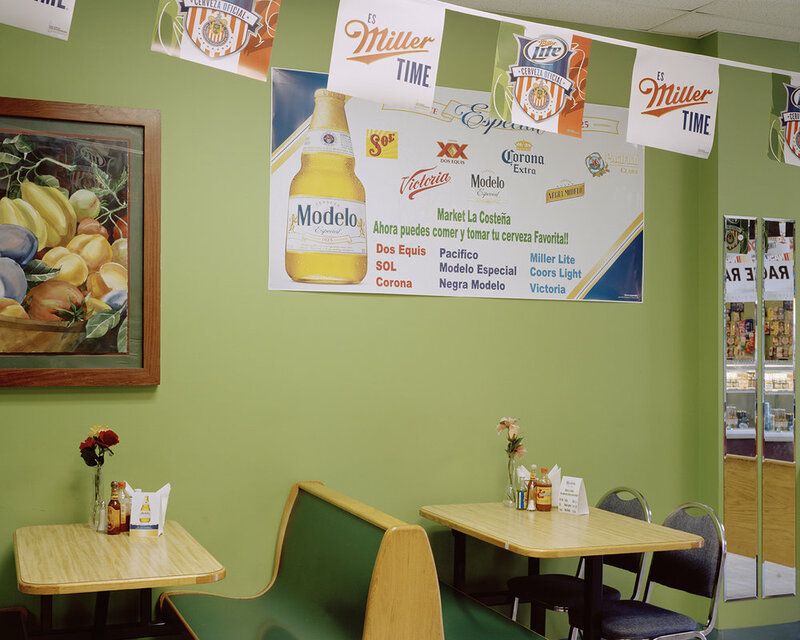 Similarly, her images of the exterior and interior of Mexican restaurants convey a recognizable story of new immigrants negotiating a sense of place in adopted community through commerce and food culture. By now, few immigrant businesses are more ubiquitous across the southern landscape than are Mexican eateries. It’s worth noting that King’s documentation of her “Hispanic” neighbors as police officers, business owners, and churchgoers complicates the stereotypical perception that some people still have of this mountain community as a refuge of rural whiteness. To my point, few images are more closely associated with rural mountain life than a young man spending a warm summer evening at his favorite fishing hole. 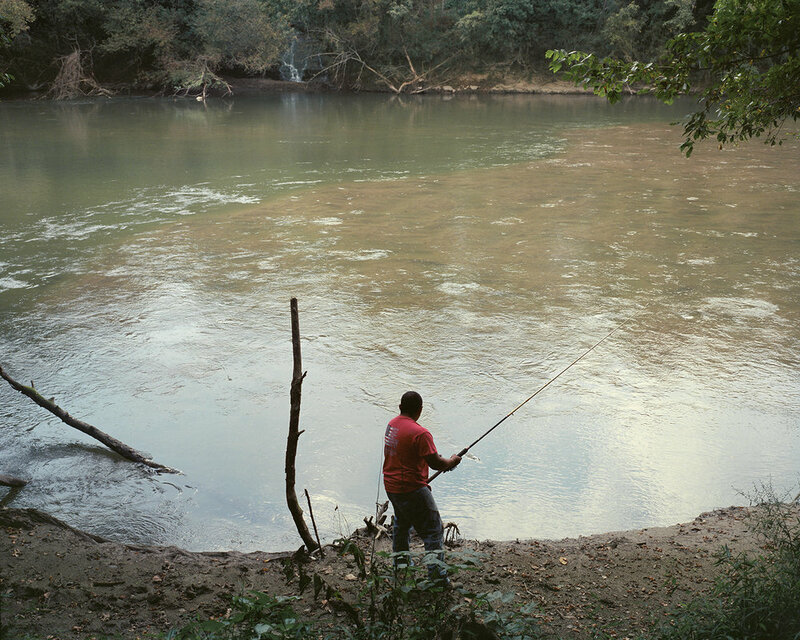 King updates this visual narrative and wants us to notice that the young man enjoying a contemplative moment near a pond’s edge belongs to a community of immigrants who are more frequently calling Appalachia their home. The other critical point worth considering about this collection is the transferability of these cultural symbols into an online environment. The “migration” of these images is especially poignant when we consider the limitations in mobility experienced by members of this community because of legal, economic, or other restrictions. However, the curious digital migration of portions of Hispanic Appalachia, which speaks quite perceptively to King’s idea of place and culture in her immediate community, also make me think about the possible loss of that particularity that makes King’s images so engaging to me as a cultural observer and Mexican immigrant who now lives and works in Appalachia. I am powerfully drawn to King’s images in this collection, but I’m concerned about their ability to speak to the experience of non-Mexican “Hispanic” immigrants as they spill out of her website into other blogs, new sites, and online photography magazines. Cultural specificity matters to documentary photographers, and I see King’s work as part of this tradition. And so, perhaps, it is worth reconsidering the usefulness of using visual iconography specific to Mexican immigrants, which Megan G. King captures in her elegant collection of photographs, to tell and re-tell a generic story of an emerging Hispanic Appalachia. Salvador Barajas writes about the intersection of migration, social trauma, collective memory, and visual culture in Appalachia and beyond. He is working on a book that looks at memory work in the third space twenty-five years after NAFTA. He lives and works in southwest Virginia. Between the years 2000 and 2010, the Hispanic population of Tennessee increased by 134%, making it the third highest growth rate of this cultural group in the country. In 2011, while studying both Spanish and Photography, I began photographing Hispanic individuals who migrated to the Appalachian Mountains of East Tennessee. This representation of a growing Latino culture in the hills of East Tennessee hints at the changing social landscape of the area, the symbiotic relationship of the Latino and Appalachian cultures, but also, how both cultures have acclimated. In a visual juxtaposition to Appalachian heritage, Hispanic culture is represented by vibrant colors, a variety of foods, and often traditional decorations. These aspects are seen in photographs of colorful business fronts, artwork in homes, and churches with bilingual signs as the community and individuals claim and negotiate their sense of place. The images introduce viewers to the value of emerging diversity in this historically conservative region of the United States; however, because of the forced fusion of these two cultures, we see similarities that allow the cultures to blend indiscernibly at times, creating an illusion of acceptance. Photographing police officers, business owners, my neighbors, and friends challenges the stereotypes fueled by discriminatory political rhetoric that many Appalachians maintain.